"McNulty Creek, St. Helens, Oregon"
McNulty Creek is located in T4N R1W and lies on the south side of Oregon's community of St. Helens. North of McNulty Creek is Milton Creek. McNulty Creek merges into Scappoose Bay. "This stream and McNulty station on the Astoria line were named for John McNulty, a pioneer of Oregon who took up a claim not far from the present site of Saint Helens." According to the U.S. Bureau of Land Management's General Land Office (GLO) Records database, On March 11, 1867, John McNulty and Margaret McNulty obtained title to 622.82 acres of T4N R1W, Sections 5, 6, 7, and 8 (1850 Oregon-Donation Act), and on June 25, 1872, John McNulty obtained title to 78.18 acres of T5N R1W, parts of Sections 4, and 5 (1820 Sale-Cash Entry). "After nearly a year and half of fundraising, the St. Helens Arts and Cultural Commission is planning to host a dedication ceremony of a new public art piece titled "Salmon Tree Cycle" in mid-September. 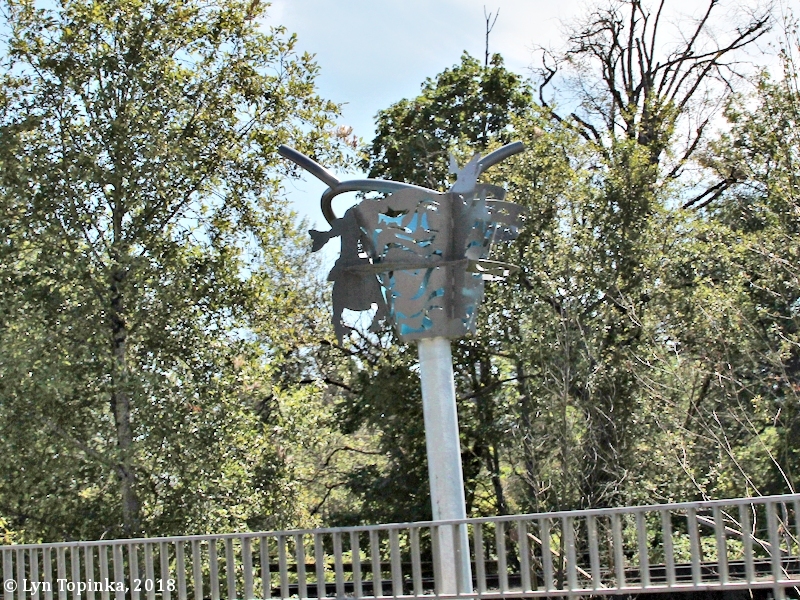 The city of St. Helens announced on sockal media last week that a ribbon-cutting and dedication ceremony for the sculputre that will sit on McNulty Creek Bridge will take place Thursday, Sept.21. In September 2015, the arts commission approved a design proposal and contract with a Portland-based architecture and design company, rhize A+D, to complete the work. 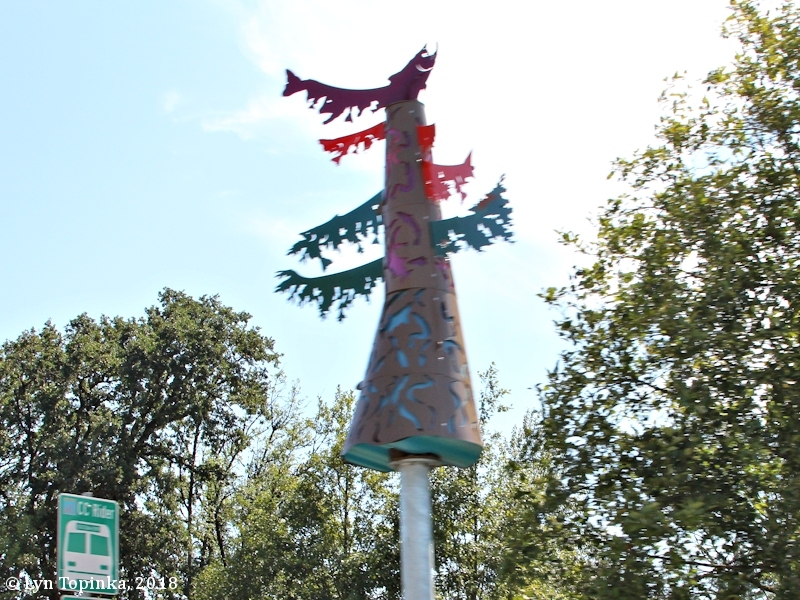 The Salmon Tree Cycle sculputre includes two pieces that illustrate the impact of salmon life cycles on the rivers they inhabit and thre trees that grow on the banks of those rivers. Source: Nicole Thill, August 26, 2017, "Ribbon-cutting planned for new St. Helens sculpture", "PamplinMedia.com" website, 2018. 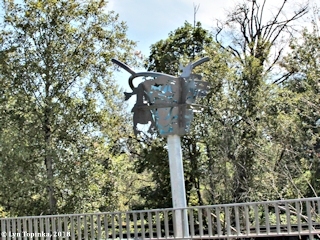 Click image to enlarge Metal Art Piece (northern), McNulty Creek, St. Helens, Oregon. View from moving car heading north. Image taken July 16, 2018. Click image to enlarge Metal Art Piece (southern), McNulty Creek, St. Helens, Oregon. View from moving car heading north. Image taken July 16, 2018.